Do you have a hometown? When someone asks where you’re from, are you able to tell them? Or do you mumble something like, “I’ve lived in a lot of places?” I do that. According to the census bureau, less than 1/3 of the people in western states live where they were born. 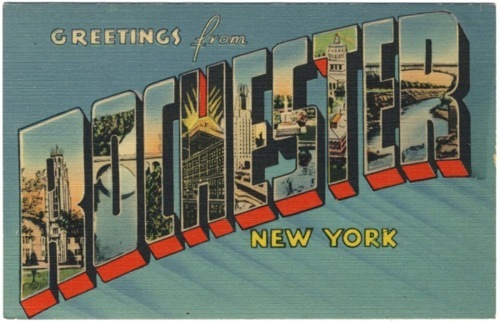 My wife comes from Rochester, NY. I was born in Poughkeepsie. We met in San Francisco. That seems to be the norm out here. I had lived in five cities and gone to six schools by the time I finished high school, so I can answer,”Where are you from?” in a lot of ways. Childhood memories are layered in ways that reminds me of geographical strata. Each place, school, and time had its own feeling tone. 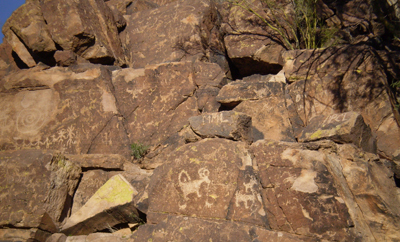 Recalling those times sometimes seems like gazing at ancient pictographs on differing layers of rock. I don’t think my parents generation was great just because they were superior beings. I believe the times demanded and fostered their greatness. Men like Dutch Lydon knew where they were from, knew what that meant, and believed in it. Now there is no more Kodak to be proud of. Silent factory chimneys stand like tombstones for that way of life. Not that smoke and soot were good for you, or that Kodak didn’t screw up in the end and screw its workers. Not that things were so good if you weren’t a white hetrosexual male. Not that my generation didn’t rebel against all that. It’s just that from our current perspective, we can see things of value we lost when this way of life came to an end. A sense of belonging and community, for one thing. Friends and family you can count on were cited as key factors in a recent survey that named the ten happiest countries in the world. Do I even need to say that the United States failed to make the cut? Sense of community is an impression, an imagining, a gut feeling, but it makes a profound difference. Walking along the Lake Ontario shore, we stopped to admire a fine old brick building, a public bathhouse, with half a dozen tennis courts sheltered from the wind in an enclosed courtyard. The bandstand in the park was under renovation, as was the carousel with its hand-painted animals. This is a city that doesn’t just pay lip service to words like “community.” A cop on patrol passed us with a smile and a “Good morning,” because, though the park was filled with people, he had nothing more pressing to do. Many in my generation grew up on Easy Rider and On the Road, filled with wanderlust and a longing for the horizon. Others married their high school sweethearts, anxious to settle down. People I know played it both ways, with differing results. There aren’t any rules of thumb. From the time of the pioneers, California has attracted people looking to reinvent themselves. This is where Norma Jean Mortenson became Marilyn Monroe. Sometimes it works out and sometimes it doesn’t. It has taken me longer than usual to write this post. I kept putting off hitting the “Publish” button in hopes of reaching some kind of conclusion. Doesn’t seem likely at this point. Just a number of questions without any clear cut answers. What does it mean to have a hometown, or maybe the question is really, how does a “town” become “home?” What does it mean to have a home, to “feel at home?” What does it mean to be from someplace? “You can’t go home again,” Thomas Wolfe famously said. Nobody asks the flip-side question, which is whether we ever really leave? I’d love to hear any thoughts you have along these lines. This entry was posted in Culture, Family and tagged Articles, Culture, family. Bookmark the permalink. Since Mrs Dim was in the RAF, and before that my Dad was a vicar, I’ve moved around a lot. I was born in the North East of England, and had a Geordie accent you could use to slice bread, but we moved down south when I was seven, to a tiny village where I lost my accent in self defence. I’ve lived in Wales, all around England and we’re now out in British Columbia. No one can guess which part of the UK I come from, because it’s always “Well, where was I born, where did I live longest, or where did I live last?” They’re all different answers. Home is where my stuff is, that’s what always felt. A new house wasn’t home until all the stuff was unpacked and installed. That’s not a very popular view, because these days we’re encouraged to believe there’s more to us than stuff. Well, maybe there is, but having my stuff around me is what makes this place home. That makes sense. At one point, we were living out of a Volkswagen van for weeks at a time in the southwest. Once it turned cold and we rented a place, however, the first thing we did was send for our stuff, or get new things. One of the latter was an inflatable alligator that somehow became associated with Christmas. But that, I guess, is another story. I grew up in a suburban city in California, and every summer we would go see my grandparents in Brazil. Four years ago we moved to Denmark, and now we’re moving back. I don’t think my city is much of a ‘hometown’ – I guess I’ll be finding out soon. But one thing I’ve known for a while now is that my home is my family. My immediate family, I mean, my parents and my sister. They are my safe place, and that means we can go anywhere and I will still be home. On the more literal side of things, I grew up in a house we owned and now we’re living in a rented apartment. I really like this apartment, but I can never forget that it’s rented, because I know that we can’t modify it if we want to. I can never feel settled in this apartment, and I expect I will never feel truly settled in a place unless I’m allowed to drill holes in the walls. And books. There have to be books. If I’m surrounded by books, I feel – not home, it’s not that easy, but I feel welcome. Thanks for your great reply, Aethersea. I can identify with what everyone has said, especially your comments about having your family and books at hand. Middle earth is as close as the book and one’s imagination. Interesting point about being able to hang up your own pictures. Reminds me of how we’d try to personalize our cubicles when I worked in the tech world. Art, pictures of family, the dogs, etc. Then cubicles got smaller, and now they are going away, in the name of some kind of efficiency BS. The result is going to be greater depersonization. Funny how strong the urge to “feel at home, even in the workplace. Wow, this is something I have been thinking about and actually contemplating a post of my own. I think as Lois mentioned above that place is certainly a part of it. But I think it is much more, its people and boundaries and familiarity and childhood connections and reminiscing and believe it or not I think it is the absence of electronic connectedness. There is a Reminiscent society in a town nearby where I live and I love to visit there Facebook page and I hate it too. I love the stories and camaraderie that members of the group often share most of them know each other and have grown up in this town or nearby. The stories evoke the connectedness that the “Hometown” would I think if I had that kind of upbringing. Instead, I have moved 37 times and couldn’t give you the name of a Hometown but rather a birthplace. When I get home at the end of the day, it feels good being with family and familiar surroundings, when I step out the door I am in a community that I like bjut have no roots with. Same thing with Tower Books, and to a lesser degree, Borders, which were still idiosyncratic enough that you could make some interesting discoveries while browsing. But anyway, I ramble. The key thing the comments point out is what a personal and complex thing that sense of place and sense of home involves.